Joe Gransden, an Atlanta musician/bandleader and vocalist, has been working as a professional musician since his first professional gig with the Tommy Dorsey Orchestra when he was barely twenty. Since 2001, when he arrived in Atlanta permanently, his ubiquitous presence and congenial personality has made him a central figure in the jazz community around not only Atlanta but the Southeast United States. On any given night Joe and his golden Monette trumpet can be seen fronting a jazz duo, a trio, a quartet or his seventeen piece Joe Gransden Big Band at any one of several local area establishments. 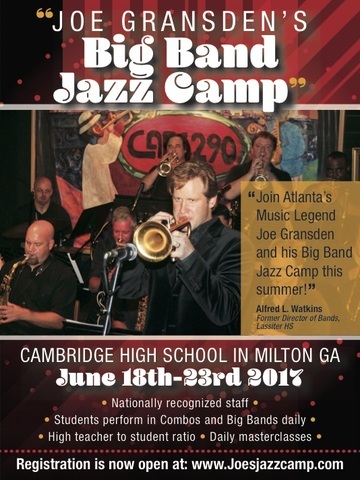 This year Joe came up with an idea to offer youthful musicians between the ages of thirteen and nineteen a rare opportunity to attend an intensive jazz camp at a very nominal cost. The camp will be held between Sunday June 18th thru Friday June 23rd at Cambridge High School in Milton, GA. The camp will allow students, who must be accepted via an audition process, a chance to work in multiple formats (duo, trio, quartet and big band) under the supervision of some of the area’s most successful professionals and world class educators. The intensive five-day program give attendees a chance to receive rare mentorship with professionals, many who play the very same instruments theses students are trying to master. The opportunity to work and develop alongside fellow students who have the same passion and desire in a nurturing environment will also add to this life altering experience. Joe tells me spaces in the program are filling up fast so anyone who has a child that is gifted or shows a proclivity for this music should not delay in signing up for this once in a lifetime experience. The cost for the full five-day program is a modest $400.00. There are also half-day programs available. The program is also accepting sponsorships and donations from private individuals. These funds will allow the program to accept worthy individual students who might otherwise not be able to attend due to lack of funds.If you love this music and you want to see it continue please consider making a donation or sponsoring one child in this worthy cause. You can find information as to how you contribute by clicking here and following the prompts on Joe’s site. Some of the amazing musicians who will be teaching and mentoring at the camp besdies Joe include acclaimed trombonists Lee Watts and Wes Funderburk; incendiary trumpeter Melvin Jones; guitarist Trey Wright; Grammy Award winning saxophonist Kebbi Williams and saxophonist Luke Weathington; Multi-reed specialist Hal Melvin; bassist Neal Starkey and Tim Aucoin; Grammy nominated drummer Sammy K and pianist/educator extraordinaire Kevin Bales.